The costumes were over the top, the crowd was raucous and the smack talk rivaled what you’d hear at a professional wrestling match. 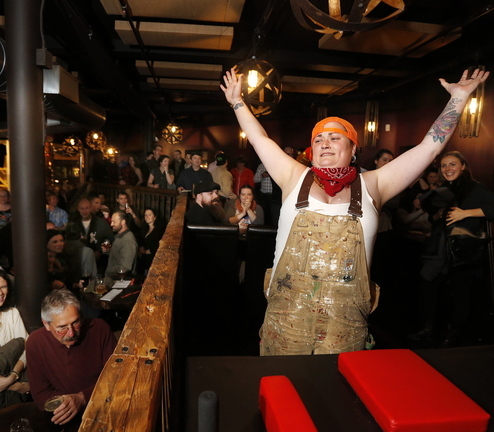 Lumber Smack Sally, White Zin Lynn, Brewnhilda, Barrel Roll Barbie, Little Bo Bash and Tina Machina were just some of the female arm wrestlers who took to the stage Thursday night for Over the Hop. Derek Davis/Staff Photographer: Kate Squibb, aka "Lumber Smack Sally" of Portland reaches for more as she tries to defeat "Barrel Roll Barbie" during an arm wrestling fundraiser at In’finiti. Photographed on Thursday. November 7, 2013. Derek Davis/Staff Photographer: "Daisy Duke Em", left, tries to intimidate her opponent, "White Zin Lynn" during a arm wrestling fundraiser at In’finiti. Photographed on Thursday. November 7, 2013. The event, at In’finiti Fermentation and Distillation on Commercial Street, was aimed at raising $1,000 to benefit Portland Gear Hub, a Portland-based nonprofit that rents and sells reused and recycled outdoor gear to encourage people to participate in outdoor recreation. About 200 people drank beer and watched as the women sat at a table — called the eliminator — and faced each other. Each contestant had to wrap one hand around a hand grip before clenching her opponent’s other hand. The first one to push her opponent’s arm to the table was the winner. In a best-of-three format, the contestants alternated between using their right and left arms. Each wrestler was introduced by the emcee, Brian Danz, who read a brief biography of each one. An entourage of followers accompanied each wrestler to the stage. 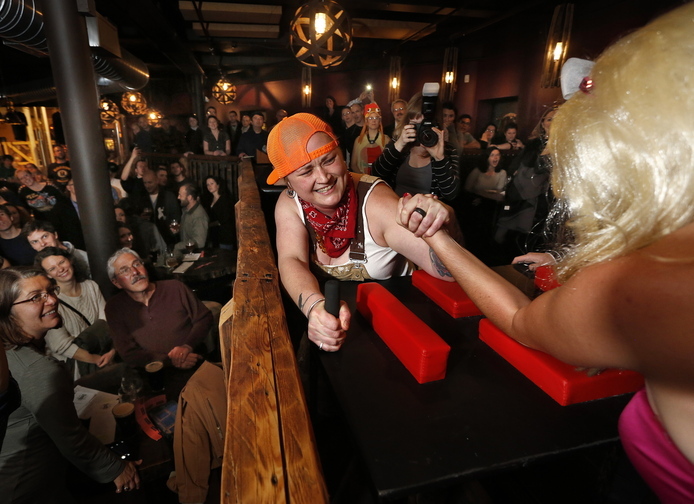 Over the Hop, part of Portland Beer Week, pitted the Maine Beer Mavens, a team of novice arm wrestlers from an informal club of about 200 female beer aficionados, against SLAP — Superhero Lady Arm Wrestlers of Portland. “This was definitely not a normal Maine Beer Mavens event,” said Lora Burns, who arm-wrestled as Triple Axel Oxana, wearing a bright blue ice skating costume. Burns, who tried to intimidate her opponent, Sylvia Wrath, by drinking vodka from a bottle and spewing the booze into the air just before their match, lost in short order. A SLAP wrestler named Tina Machina — real name Tina Lewis — then grabbed the diminutive Burns, tossed her on her shoulder and carried her off the stage. Tina Machina was favored to win her match against the Maine Beer Mavens’ White Zin Lynn — otherwise known as Erica Colby — but lost in an upset. White Zin Lynn went all the way to the final match, where she lost to SLAP’s Lumber Smack Sally — aka Kate Squibb. The referee was Jenna Keys of Portland, a member of SLAP who dressed as a Viking — Voom Voom Valhalla. She scrutinized each match to make sure that no one tried to cheat by using their body weight instead of arm strength, and to ensure there were no injuries. An arm wrestler known as Flex broke her arm during a fundraising event in September. “We take the competition very seriously, but accidents do happen,” said Keys, who trains for her matches by lifting her three young children. The event’s name, Over the Hop, paid tribute to the 1987 Sylvester Stallone movie “Over the Top,” considered an arm wrestling cult classic.